Todd Wortman, DDS (New Rochelle) - Book Appointment Online! 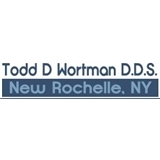 Welcome to the New Rochelle dental office of Todd Wortman DDS P.C. We have been providing the best possible dental care to the New Rochelle community for 20 years. Our experience in dentistry is coupled with genuine concern for our patients. Our friendly and knowledgeable staff is committed to understanding and meeting all of your dental needs. At our office, our goal is to help you have the bright and healthy smile you’ve always wanted. Todd Wortman DDS P.C. is a full-service dental office that uses cutting-edge technologies in dentistry. We strive for excellence and pride ourselves in practicing state-of-the-art dentistry. Our aim is to help our patients enjoy the best possible dental health. In keeping with that goal, we provide a wide range of general and cosmetic dentistry options. The staff at Dr. Wortman's office are very professional. The dental hygienist is very friendly and makes sure you are comfortable when taking the dental x-rays. Dr. Wortman is also very friendly and gentle. Would definitely recommend him to anyone in the area.